Sustainability of health benefits from cardiac rehabilitation (CR) requires adequate changes in lifestyles. Preventive medicine highlights a triadic guideline referring to cardioprotective behaviour, avoidance of associated polymorbid developments (e.g. depression), and improvement of life-quality. To assess the influence of long-term CR management (in Austria phase 4) offered by the Austrian Heart Association (ÖHV) on changes in lifestyles according to the INTERHEART CHD-risk parameters, a questionnaire measuring the extent of phase 4 influences on lifestyle modifications according to the INTERHEART parameters physical activity, stress, nutrition, body mass index (BMI), smoking, and alcohol was developed. Data were gained from a non-preselected sample of cardiac patients with various diagnoses (n=204; age 41–91, average 71.8; standard variation 7.8, 48% cardiovascular). ÖHV activities were found to exert a strong influence on health sports (various indoor and outdoor aerobic activities and mobility exercises), stress-reduction, and nutritional adjustment, contrasting low influence on the awareness of diabetes risks and alcohol/nicotine consumption. Social inclusion is considered an important life-quality factor supporting also the sense of security. Long-term CR management is an efficient instrument for cardioprotective lifestyle modification. The important influence on patients requires especially high sports cardiologic standards and psycho-educational competence. Close collaboration between different phases/stages of CR, as well as similar international organisation should be fostered. In 2009, Willmer and Waite1 published a study on the effectiveness of phase 4 cardiac rehabilitation (CR), suggesting that there are observable benefits in participating in long-term phase 4 CR. Those who decline phase 4 CR clearly do less well. In Austria, the Austrian Heart Association (Österreichischer Herzverband/ÖHV) is in charge of long-term CR management providing a nationwide network of heart support groups. Cardiac prevention, acute cardiology, and CR are interacting disciplines. Historically speaking, it took decades to establish cardiac prevention awareness in the general population and to provide comprehensive CR services. After a ‘step change’ in one’s cardiac condition, such as myocardial infarction (MI), acute coronary heart disease (CHD) or first diagnosed heart failure and subsequent acute care, formerly patients were usually told to change their lifestyles and to protect their hearts, though clinicians could not give precise advice, e.g. concerning sports cardiologic guidelines, nor did patients find long-term support by specialised rehabilitation organisations. In Austria, this problem led to the foundation of the Austrian Heart Association approximately four decades ago. Though in those early times there was doubt about the effectiveness of community-based long-term rehabilitation,2 today, long-term secondary prevention and heart support groups have become an international standard.3 Due to different health systems and medical credos in the world there is no standardised terminology in cardiac rehabilitation,4 a problem causing misunderstandings and restricting transferability. Long-term outpatient CR (also known as phase 3 or phase 4 CR): a programme that provides longer-term delivery of preventive and rehabilitative services for patients in outpatient settings. Long-term maintenance for another 12 months. Germany and Switzerland share similar systems, phase 1 referring to early mobilisation at hospital, phase 2 subsequent treatment in a CR clinic or in smaller specialised outpatient centres, phase 3 long-term rehabilitation in heart support groups. These guidelines are, in general, still valid for the Austrian Heart Association programme, of course permanently readjusted according to cardiological standards. As there is no regular obligation to join heart support groups, adherence and sustainable rehabilitation benefits depend on individual motivation. The huge behavioural impact on cardiovascular processes is no longer doubted. Still there is the question, whether or not long-term CR activities cause cardioprotective changes in lifestyles. Sufficiently extensive networks for local long-term CR availability depend on national healthcare policies. These programmes are partly not as rigorously assessed, as for example heart surgery. Nevertheless, optimised outcomes require highest medical standards. Various studies elucidated the aggressiveness of CHD-related behavioural risk factors, highlighting the effectiveness of lifestyle changes in heart patients.24 As well as that,25 in addition to exercise training, a comprehensive secondary prevention programme for cardiac patients requires aggressive reduction of risk factors through nutritional counselling, weight management, and adherence to prescribed drug therapy. Clinical trials during the past two decades have provided conclusive evidence of reduced mortality in patients with CHD via reduction of individual risk factors by pharmacological and nonpharmacological interventions. The proven salutary impact of comprehensive lifestyle modification often has been overlooked and underemphasised as a first-line approach to secondary prevention. Referring to behavioural and environmental risk factors of cardiovascular diseases the INTERHEART study,11 identifying smoking, lipids, hypertension, diabetes, obesity, diet, physical activity, alcohol consumption, and psychological factors as outstanding foci in preventive and rehabilitative medicine, became a cornerstone for the cardiology of the new millenium.26 Most strikingly, it showed that the PAR (population attributable risk, indicating the proportion of cases that would not occur in a population if the risk factors were eliminated) of 90.4% for all nine risk factors suggests that, statistically, the nine risk factors combined accounted for basically all of the risk of acute MI in this study population – a truly startling and unanticipated result. Consequently, behaviour and psyche lost their marginal position and gained central interest. This cross-sectional questionnaire study investigates how cardiac patients perceive the effect of long-term CR programme attendance on health behaviour changes. In order to evaluate the measurable cardioprotective benefits of long-term CR, further investigations are needed. The crucial question of this study is, whether or not the programme offered by the Austrian Heart Association is decisive for lifestyle changes in the perception of the participants? 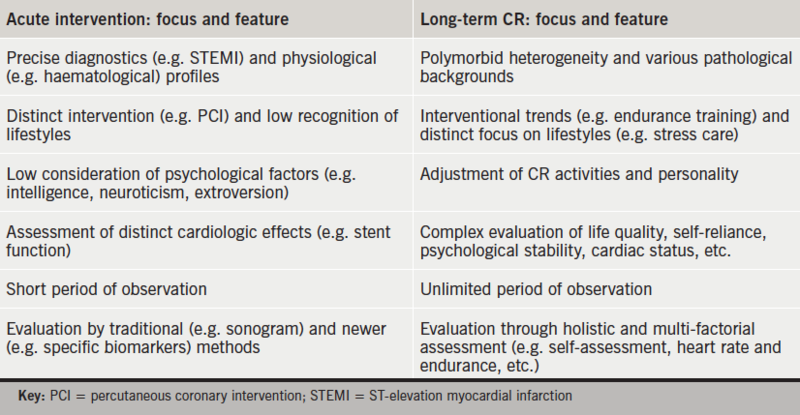 This issue refers also to complementary profiles of acute cardiological interventions and features of long-term CR (table 1). Seven items referring to physical activity, smoking, body mass index (BMI)/obesity, stress, eating habits, sugar/awareness of diabetes risks. As not directly manageable through behavioural changes, lipids and arterial hypertension were not included. Previous informal piloting among people attending phase 4 was used to estimate the validity and comprehensibility of the items. Equidistant scales (0, 1, … 10) are assumed to yield interval scale data. Still further research is needed to provide fully validated tools to investigate behavioural changes in cardiac patients. Considering the advanced age of participants the questionnaire was easy to understand and to handle. Patients should not get stressed or require individual help for answering. Did the ÖHV decisively contribute to changes in my lifestyle for better health? Because of my participation in ÖHV activities I have … (following the single behavioural parameters). Rank between 0 and 10, “0” meaning “not at all”, “10” meaning “absolutely”. If participants thought an item not applicable, they could leave it blank. During a two-month period in spring 2014, members participating in various activities of the Austrian Heart Association in the Austrian federate states of Carinthia, Lower Austria, Salzburg, Tyrol and Vienna, were asked to complete the questionnaire. The profile of the participants is shown in table 2. People attending phase 4 programmes perceive that the programmes have high influence on health sports motivation and sustainability. The programmes support stress reduction/competence of stress management and changes in eating habits. Participants in this study did not perceive that attendance at phase 4 contributed considerably to changes in smoking behaviour, alcohol and sugar consumption or weight reduction. A few unsolicited comments by some participants highlight the importance of experienced social inclusion, regained self-confidence and life-activity, empathetic talks and psychological support. Optimised long-term CR and secondary prevention has to be based on an individually shaped balance between lifestyle, pharmacological treatment, socio-cultural welfare, and the experience of well-being. This requires close collaboration between medical cardiology, long-term CR, and adequate social conditions. The high influence of long-term CR programmes on patients requires compatibility with the most recent cardiologic guidelines (e.g. sports cardiology, psycho-cardiology) and holistic rehabilitative medicine. The specific quality (e.g. empathic understanding) of heart support groups is of high potential for psychological rebalancing. Research on best practice of collaboration between the CR phases has to be internationally intensified. Long-term CR programmes are not only cost-efficient, but also of high individual and medical economic benefit27. I would like to thank my colleagues RM Dejaco, F Fink, H Kiener, F Radl, D Schiffrer, H Schulter and R Weißsteiner for the standardised and objective generation of empirical data. No financial support, no funding. 2. Campbell NC, Grimshaw JM, Ritchie LD et al. Outpatient cardiac rehabilitation: are the potential benefits being realised? J R Coll Physicians Lond 1996;30:514–19. 4. Wenger N (ed). Cardiac Rehabilitation: Guide to Procedures for the Twenty-first Century. New York: Taylor & Francis, 2005. 6. Thompson DR, Yu CM. Cardiac rehabilitation: China. In: Perk J, Gohlke H, Hellemans I et al. (eds). Cardiovascular Prevention and Rehabilitation. London: Springer, 2007;pp 48–51. 8. WHO Regional Office for Europe. Needs and action priorities in cardiac rehabilitation and secondary prevention in patients with CHD. Document EUR/ICP/CVC 125 4328g. Geneva: WHO Regional Office for Europe, 1993.